Hipstamatic on our iPhones give us the fun of switching through lenses, film and flash options from yesteryear that we use to take a picture with. 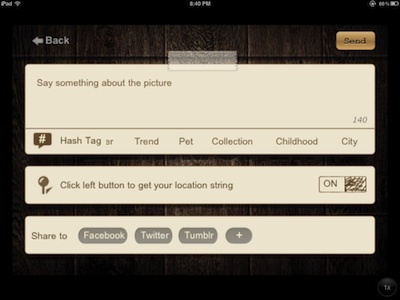 Instagram gives us the fun of sharing our photos with friends, no mater where those friends might be around the world. You can shoot images with the Instagram app too, but the mix and match of lens/film is half the fun of taking the picture. A fun option that popped up at the office today is Leme Cam. It runs on the iPad2, iPhone and iPod Touch. 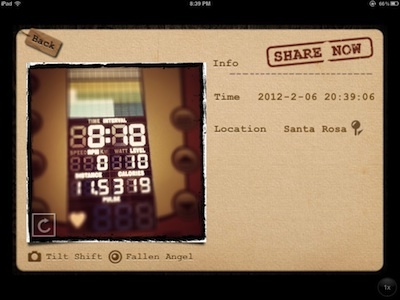 While not being a Universal app, it run fine in 2x mode on the iPad2. 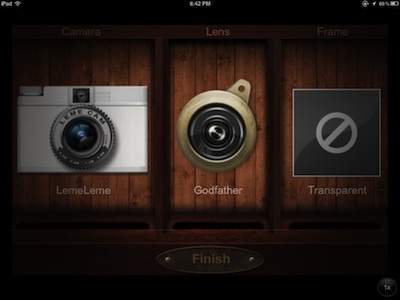 Leme Cam offers a spinner of camera, lens and frames options. A slightly different take on the film/lens/flash options in Hipstamatic. Many of the cameras you will recognize as Lomo cameras. We’ll list all of them at the end of this post. Interesting for us was the occasional lens override by the app, where some cameras will only allow ‘random’ lenses… who knows what that shot till look like, till you snap the photo. 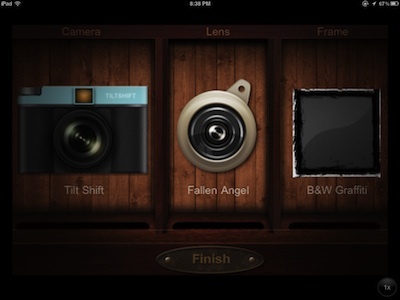 When you have chosen a camera/lens/frame, hit the Finish button to go to your camera view for snapping your creative image. Buttons on the back of the camera include Album to use a image from your iPad’s library, CamBag takes you back to the camera/lens picker, on the right is the buttons to snap the picture and My Photos to see images you have taken with Leme Cam. There is a nice focus/exposure feature. Tap one on the view finder where you want the camera to focus, then double tap on the spot you want to use for a separate exposure point. 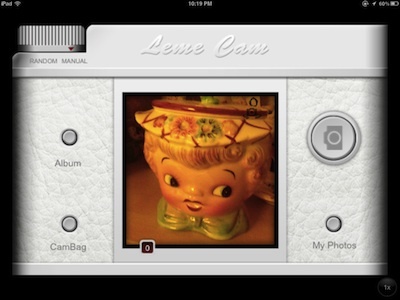 After you snap your photo, choose the Leme Cam ‘My Photos’ to see the photos you have taken. Along the top of the screen is ‘Film’ which is your photos, ‘Calendar’ is stacks of your shots by day, ‘Tag’ is photos sorted by Tags you have added to them and ‘Footprint’ is a world map with images taken sorted by location. 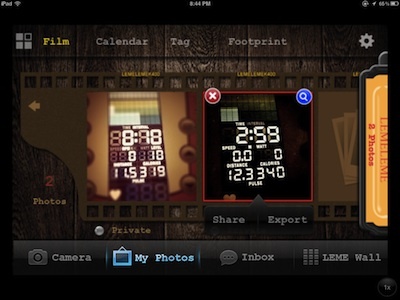 Tap an image on the camera roll to delete, get more info, share on social services or export to your iPad photo Library. Each photo has the option to mark ‘Private’. Jump back to the camera, look at your photos taken and view the Leme social photo share through the button at the bottom of the screen. Tapping the magnifying glass takes you to more info about the photo, including the time, location, camera and lens the photo was taken with. 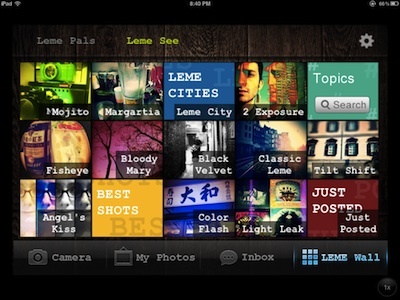 Leme Cam ‘Share’ takes you onto the different services you may want to show off your snap shot on. With a photo chosen and ‘Share’ tapped, Leme Cam presents you with a page to enter text, hashtags and what social site you post the photo to. Facebook, Twitter, Tumblr and the Leme See social share. Even if you don’t add a photo to the Leme Cam’s Leme See social photo share, you can still look through what others are sharing. Default has the photos sorted by the camera solution chose by others to take the photos with.